Pexflow Oxygen Barrier PEX Tubing (EVOH) is used for residential and commercial radiant heating system applications. It keeps oxygen along with other elements from infiltrating and corrupting the key mechanical components in heating systems. Strong and flexible cross-linked polyethylene tubing with exceptional temperature and pressure ratings that exceed expectations for plumbing projects in hydronic radiant heating applications. Commonly used in medium to large size radiant floor heating projects as well as for baseboard and radiator heating systems. The hydronic tubing system was designed to be the most efficient snow melting system for outdoor use on concrete ground. This also provides additional benefits of freeze protection by expanding and contracting its tube that is resistant to breakage. The tubing can withstand temperature aging with longer life expectancy and exceptional maintenance free performance. For optimal leak free water flow connections, the tubing system works with cinch clamps seal accessories ensuring continuous performance. Made using a "Silane" or "Moisture Cure" method. 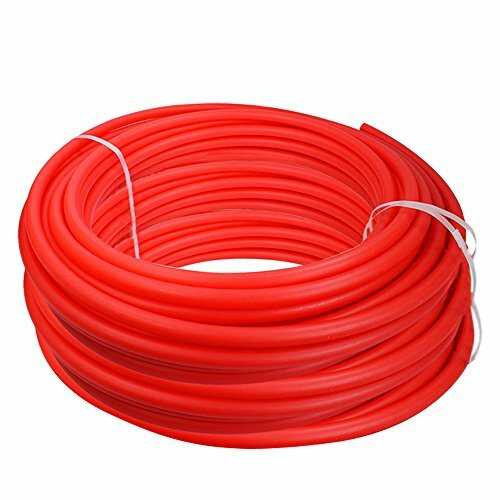 PEX Tubing is marked every 5 Feet and conforms with ASTM F876, ASTM F877, CSA B137.5, NSF 14, NSF-RFH & ASTM standards. Note: Can be used for cold water system, but not potable water. If you have any questions about this product by PEXFLOW, contact us by completing and submitting the form below. If you are looking for a specif part number, please include it with your message.